Sunspots are planet-sized conglomerates of bundles of intense magnetic field lines on the surface of the Sun. They are known to cause explosions (solar flares) which can directly impact our technological infrastructure. What astrophysical mechanisms are responsible for the formation of sunspots and how do they drive explosive events are important questions in our quest to understand the Sun's activity and its magnetic effect on Earth. To tackle these questions, an international research team led by Shin Toriumi (Specially Appointed Assistant Professor at the National Astronomical Observatory of Japan) analyzed observations of sunspots as they formed taken by Hinode, the Solar Dynamics Observatory (SDO) and the Interface Region Imaging Spectrograph (IRIS) satellites. The team modeled the observations using state-of-the-art numerical simulations performed on the Pleiades supercomputer at the NASA Ames Research Center. 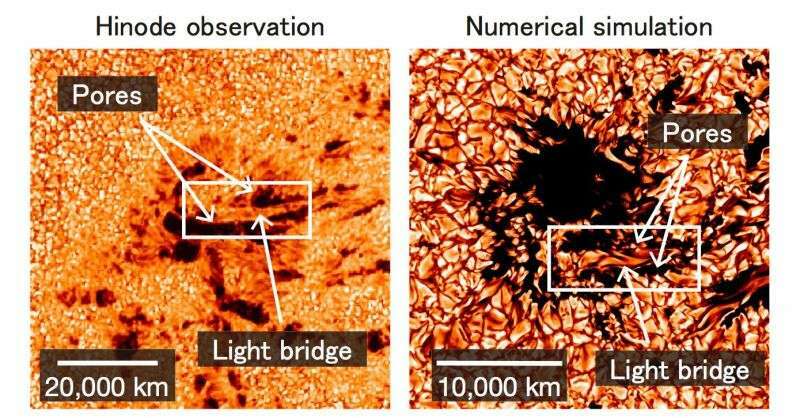 The study reveals how during the course of sunspot formation the territorial struggles between magnetic bundles emerging onto the Sun's surface drive the formation of so-called 'light bridges' and the generation of plasma jets and explosions. This study reveals, for the first time, the intimate relationship between the magnetism hidden in the solar interior, sunspot formation at the surface, and the dynamism of the Sun's atmosphere. The peer-reviewed results will appear in The Astrophysical Journal. Sunspots, mysterious dark speckles on the Sun's luminous surface, have been observed and monitored by astronomers for centuries. However, it was only in the early 20th century that George Ellery Hale at Mt. Wilson Observatory discovered their true nature. Using the newly discovered atomic physics, Hale attributed the polarized light from sunspots to the existence of intense magnetic fields. With field strengths of 0.3 Teslas and above, sunspots have magnetic fields stronger than those generated inside the magnetic resonance imaging (MRI) machines in hospitals. Sunspots are so large that several Earths could fit into each one. In a sense, sunspots are like planet-sized MRIs. The intense magnetic fields of sunspots energize the Sun's atmosphere, often triggering solar flares and ejections that have a direct impact on the space environment around the Earth. How sunspots are born, how they evolve, and how they impact space weather are questions central to our understanding of the Sun and the magnetic relation between the Sun and the Earth. Space missions such as Hinode, the Solar Dynamics Observatory (SDO) and the Interface Region Imaging Spectrograph (IRIS) allow scientists to witness the birth of sunspots in unprecedented detail. These combined observations reveal how magnetic field lines in the Sun's interior emerge onto the surface. First, the magnetic fields appear as 'small' bundles the size of cities and states. Sometimes, when two neighboring 'proto-spots' (known as pores) approach each other, they squeeze the intervening weakly magnetized plasma into an elongated structure called a light bridge. As the coalescence progresses, the light bridges are eventually squeezed out of existence and fully-fledged sunspots are formed. The power struggles of the magnetic field during this amalgamation process triggers repeated episodes of plasma jets and explosions. Dr. Toriumi and his colleagues tracked the formation of a sunspot in unprecedented detail using data from Japan's Hinode satellite as well as data from NASA's Solar Dynamics Observatory and the Interface Region Imaging Spectrograph. By combining this data with a detailed computer model of sunspot formation performed on the Pleiades supercomputer at NASA Ames, their work explains how the pores merge, how sunspots are created, and why explosions and jets occur between the merging pores (Fig. 1). First, they analyzed the satellite observation data and determined the detailed magnetic structures of the pores and bridge as well as the mechanism for the explosions and jet ejections (Fig. 2). High-resolution observations of the surface magnetic fields by Hinode revealed that the two merging pores have strong, vertical magnetic fields while the sandwiched light bridge harbors weak, horizontal fields. In addition, IRIS observations of the atmosphere above the light bridge showed that explosions and jet ejections take place repeatedly and intermittently as a result of magnetic reconnection. This means that the horizontal fields of the bridge repeatedly snap and establish new connections with the vertical fields of the surrounding pores. This results in sudden, repetitive bursts of activity (explosions and jet ejections). What drives the formation of the light bridge and the misalignment between adjacent magnetic fields? The team answered this question with the help of NASA's Pleiades supercomputer. 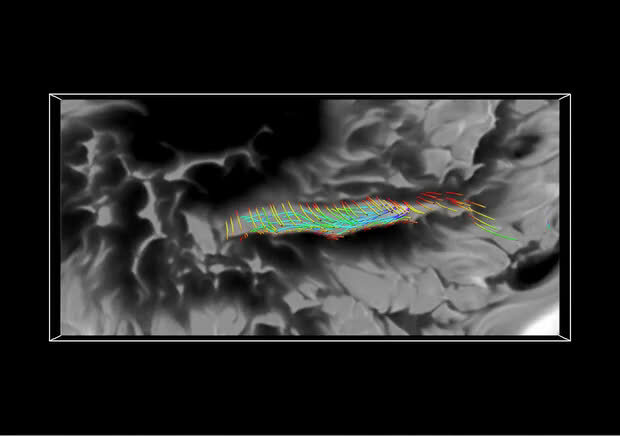 Their computer model showed how streams of magnetism in the solar interior bursts onto the surface of the Sun. The emerging magnetic flux first appears as small bundles, but self-organizes into larger conglomerates to eventually form a sunspot. The model reproduces the light bridge and pores found in the observations (see Fig. 3) and offers the following explanation. As two walls of magnetic flux approach each other during sunspot formation, plasma with weaker magnetic fields is sandwiched between the walls. As this trapped material is squeezed, it appears as a light bridge at the surface (see Figs. 4 and 5). The magnetic field of this trapped plasma is misaligned relative to the neighboring strong fields, which results in magnetic reconnection causing repeated eruptions and plasma jets (see Fig. 6). This research reveals that subsurface motions in the Sun are the ultimate driving force of bursty activity in the Sun's atmosphere. The solar interior serves as the reservoir of energy that gives birth to sunspots, which structure the magnetic field of the Sun's corona and determine how the Sun affects the Earth magnetically. The similarities between observations and numerical simulations suggest that we are beginning to understand the fundamental processes operating in the Sun's interior and atmosphere. These physical principles, which dictate the evolution of magnetic plasmas, also operate in the heliosphere, in other astrophysical objects, and in fusion devices in the laboratory. Missions including Hinode, SDO, and IRIS observe the Sun, turning it into a natural laboratory for studying plasma physics.